In our previous post (ITQ’s End User Portal for System Center Orchestrator (EUPSCO) – Part 6: Portal Configuration), we covered the post-install Portal Configuration. In this post we follow Damian Flynn’s steps on the First Launch. The following is a re-write (to accommodate screenshots) from Damian Flynn’s article, with the addition of screenshots by me. Now that the installation and configuration is completed, we can now check/test the website to ensure everything is working. If you created a new Website in Internet Information Services (IIS), you may have to start the website (as it is Stopped by default). 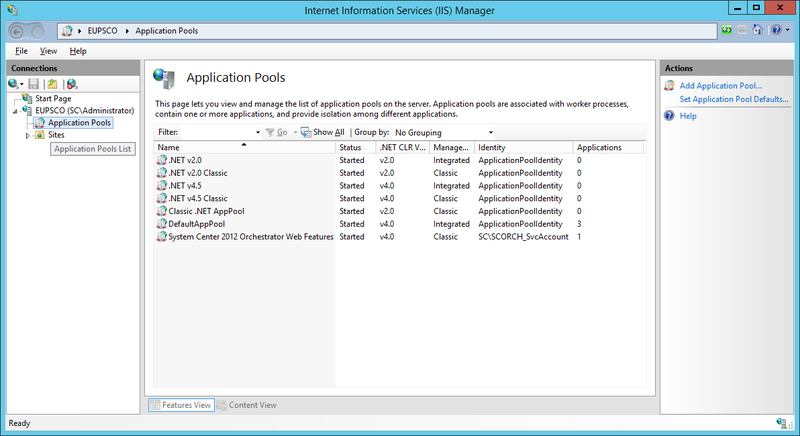 Launch the Internet Information Services (IIS) Manager, expand ServerName > Sites, and select the website. Then right-click on the website and select Manage Website > Start. One the website has been started, open a browser and navigate to the site. In my lab example this is http://EUPSCO/. You can also use http://localhost/. It may take a few minutes to load the site the first time, because Internet Information Services (IIS) needs to compile the code before loading it. You may be prompted to authenticate (login) to the site, as it is not listed in the Trusted Sites list. 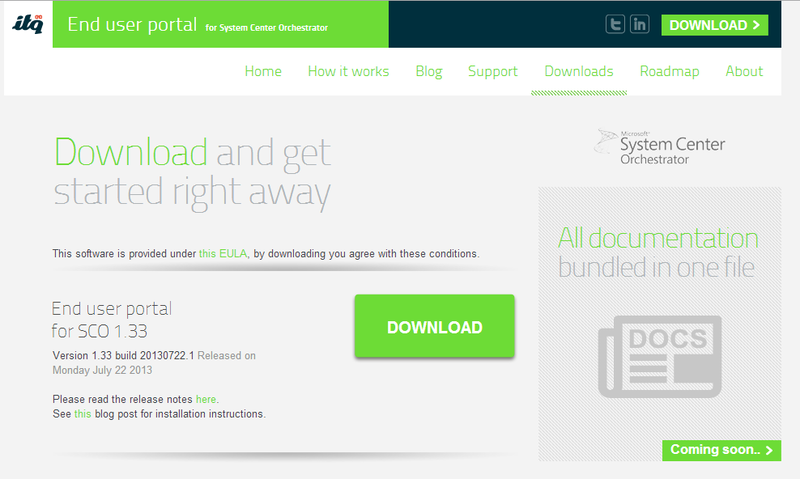 Also, by default the Domain Administrator is the administrator account for the portal. If you want to change this, open the Web.Config file and look for the key entry labelled “AdminUserIDs”. That’s it for this post series. In the future I will post articles about creating Orchestrator Runbooks. Feel free to comment, rate the article, or contact me with requests for future articles. 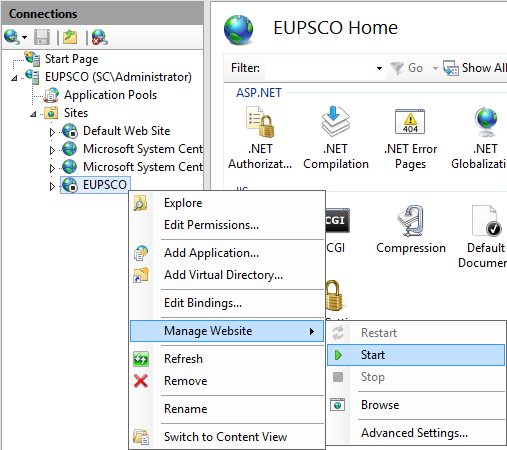 In our previous post (ITQ’s End User Portal for System Center Orchestrator (EUPSCO) – Part 5: Portal Installation), we covered the installation of the End User Portal. 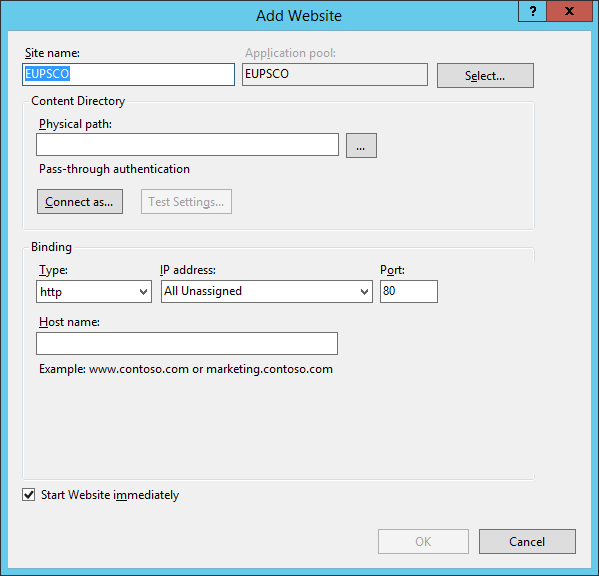 In this post we follow Damian Flynn’s steps on the post-installation Portal Configuration. To perform the Portal Configurations, launch Windows Explorer and navigate to the location containing the extracted website files. Locate the Web.Config file. Open the Web.config file in a suitable editor (i.e. Notepad). Search the Web.Config file for a key entry labelled “DomainSearchRoot“. Change this entry from “DC=test,DC=local”, to match your Active Directory domain. In my lab example, my domain is called “SC.LAB“, so my key entry is “DC=SC,DC=LAB“. Next search the Web.C0nfig file for a key entry labelled “OrchestratorServiceURL“. 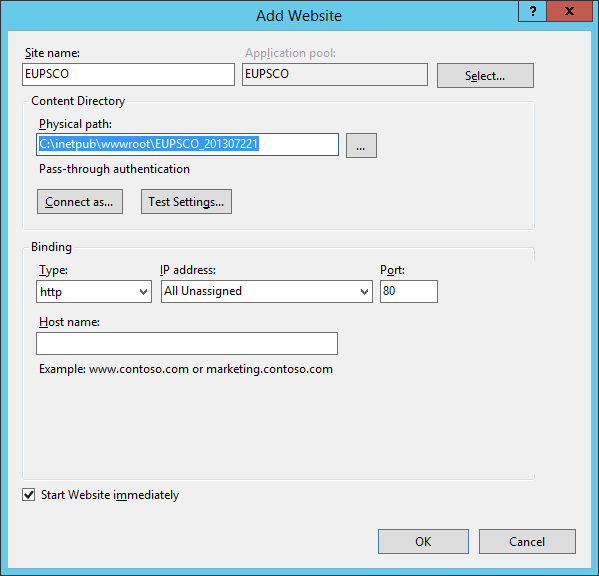 Change this entry from “http://%5BSCO SERVERNAME]:81/Orchestrator2012/orchestrator.svc”, to match your Orchestrator Web Service URL. 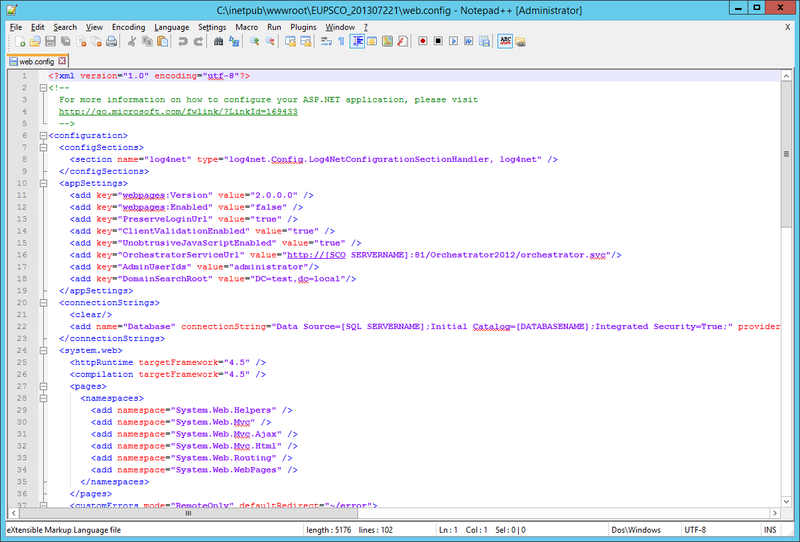 In my lab example, this is “http://EUPSCO.SC.LAB:81/Orchestrator2012/Orchestrator.svc“. Finally, search the Web.Config file for a key entry labelled “Database” within the ConnetionString code section. We need to change the DataSource and InitialCatalog references to connect to the database we created previously. In my lab example, the DataSource is EUPSCO.SC.LAB. IMPORTANT: If you are using a Named SQL Server Instance, then your DataSource should be “ServerName.DOMAIN\InstanceName“. Since I created a Named SQL Instance in my lab, instead of using the default instance, my DataSource is “EUPSCO.SC.LAB\EUPSCO“. In our next post, we will discuss the End User Portal First Launch and what to expect. In our previous post (ITQ’s End User Portal for System Center Orchestrator (EUPSCO) – Part 4: Database), we covered setting up/preparing the Prerequisites. In this post we follow Damian Flynn’s steps on the Portal Installation. 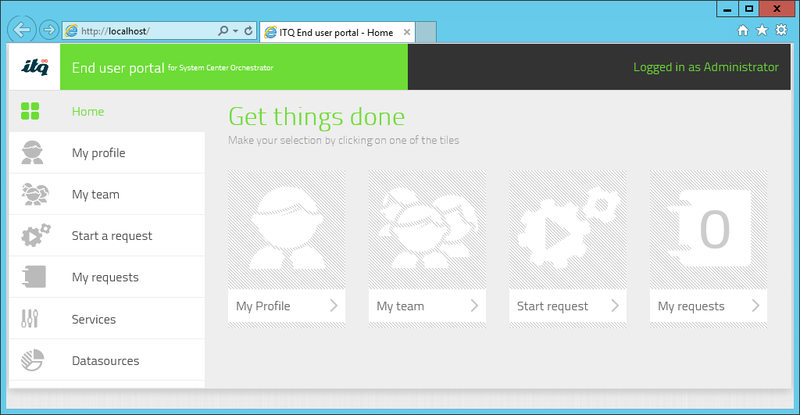 Now that we have everything setup, we can now perform the installation of the End User Portal. Monday July 22 2013. The files are contained within a .ZIP file. After you have downloaded the files, extract them to a general location. I have extracted my to \Downloads\EUPSCO_201307221. Since we are performing this installation on the same server that Orchestrator is installed on, Internet Information Services (IIS) is already installed. We could use the “Default Website”, however, for purpose of demonstration, we will create a new IIS Website for the End User Portal. Start by launching Internet Information Services (IIS) Manager. 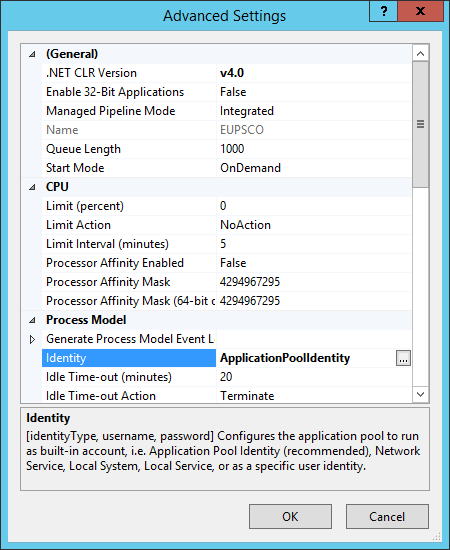 In the Connections Pane, expand the Server and select Application Pools. 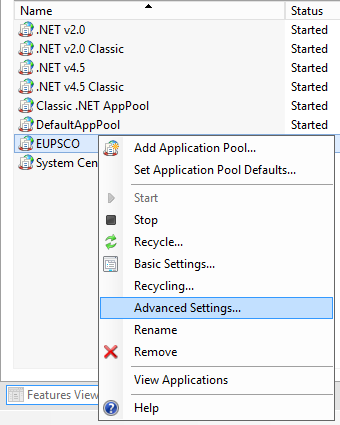 Right-click on Application Pools and choose Add Application Pool. 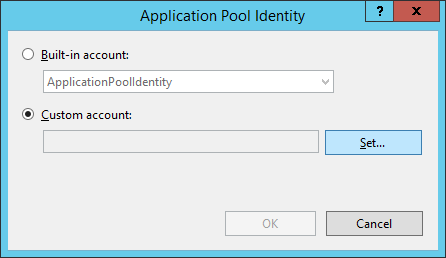 On the Add Application Pool dialog, provide a name for the pool. In my lab example, I am using EUPSCO. 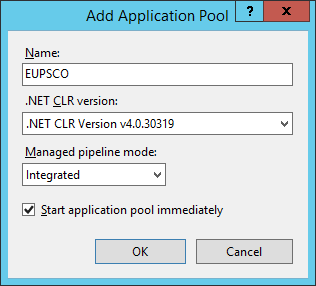 Ensure that the .NET CLR Version is set to v4.0.xxxxx, then click OK to create the new Application Pool. In the details view, you should see our newly created Application Pool. Right-click our newly created Application Pool and select Advanced Settings. On the Advanced Settings dialog, find the Identity property and select it. Click on the “…” button to display the Application Pool Identity dialog. Select the Custom Account option, and click the Set button. In the Set Credentials dialog, provide the details for the Service Account we created, then click OK. Be sure to include DOMAIN\UserName. 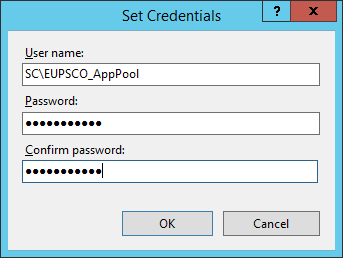 In my lab example, this is SC\EUPSCO_AppPool. 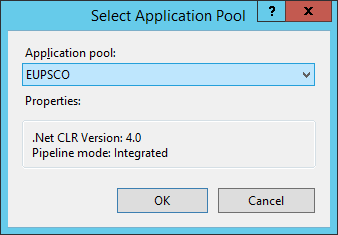 Click OK to close the Application Pool Identity dialog, and OK again to close the Advanced Settings dialog. 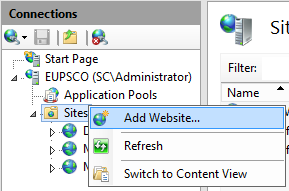 Back in Internet Information Services (IIS) Manager within the Connections Pane, right-click on Sites and select Add Website. On the New Website dialog, provide a name for the new website. In my lab example, I used “EUPSCO”. Then click the Select… button for the Application Pool. On the Select Application Pool dialog, choose the Application Pool that we previously created from the drop-down list, then click OK.
Back on the Add Website dialog, provide the Physical Path to the extracted files you downloaded. In my lab example, even though I extracted the .ZIP file to the \Downloads\ folder, I also copied the extracted files to the default Internet Information Services (IIS) directory; namely C:\inetpub\wwwroot\. Click OK to finish creating the new website. In the Connections pane, select the newly created website. 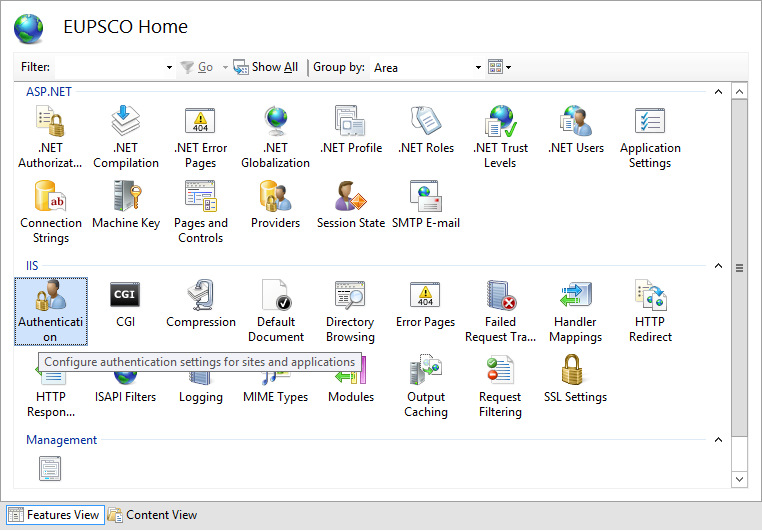 In the Features View pane double-click on Authentication. On the Authentication settings, set all Authentication Methods to Disabled, and set Windows Authentication to Enabled. We now have the Website configuration completed. 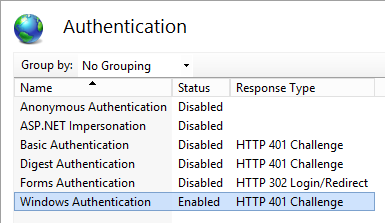 We still have some Application Settings to configure to connect it to Active Directory for authentication, connect it to the Orchestrator Web Service, and to connect it to the database that we created. In our next post, we will discuss the Portal Configuration required.